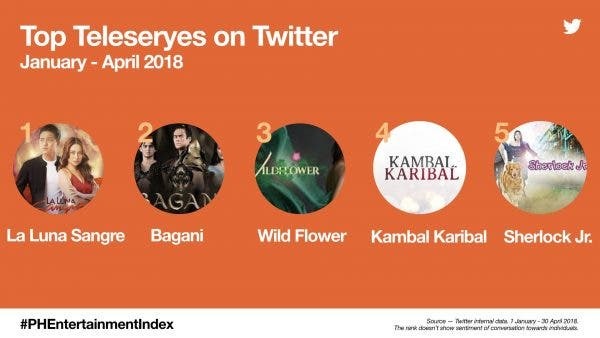 Twitter Philippines has released the first edition of its Philippine Entertainment Index as to the love teams and teleseryes who topped the site from January to April of 2018. The most talked-about teleserye in the country based on engagement is ABS-CBN’s “La Luna Sangre.” It is followed by two other Kapamilya shows namely “Bagani” (#2) and “Wildflower” (#3). Completing the Top 5 are Kapuso programs “Kambal Karibal” (#4) and “Sherlock Jr.” (#5). When it comes to Love Teams, Aldub is still no. 1 this year despite the fact that the Alden Richards and Maine Mendoza started to commit to separate projects. Following closely at no. 2 is MayWard. 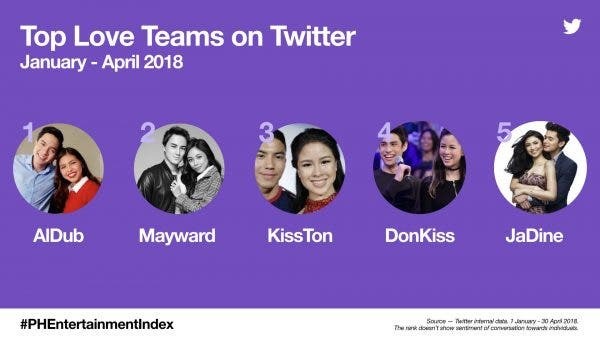 Completing the Top 5 are KissTon (#3), DonKiss (#4) and JaDine (#5). Rhian Ramos Breaks Up with Mo Twister on Twitter?